SOAR Youth Projects provided regular social activity groups for young people with additional support needs. A programme of activities is available including, trips, art and crafts, sports cooking and baking. Activities were based in Invergordon, Tain and Alness. The young people aged 5-19 years were able to socialise, increase skills and confidence through attending the groups out with school hours. SOAR Youth Projects delivered 114 sessions of activities to young people aged 5-19 years with support needs through the provision of, swim/supper club, average of 6 young people in attendance each session in term time. Youth Club, average of 15 young people attending each session in term time, school holiday clubs an average of 12 young people attending per session. Activities have included, outings to forests, beaches, playparks, parks, local leisure centres, cinema, sports have included; cycling, swimming, golf, basketball, bowling, others including messy play, creative movement, arts & crafts, model making, cooking, and baking. SOAR does not have a waiting list and tries to ensure all the young people have an equal amount of time to attend projects. We always have enough staff each day to ensure if an emergency situation arose we would be able to offer the child a space on that day. Staff training has been very positive including training on Autism, First Aid, epilepsy, Health and Safety, Manual Handling as well as in house training to mention a few. We access specialised training to ensure we are able to meet the needs of the young people who attend the projects. Feedback has been successful from young people and their carers enabling us to deliver their chosen activities. Through a consultation, 3 future pilot projects will be developed and funding sourced to deliver them. Many young people have developed lasting friendships from attending the clubs. Socially, the young people are mixing very well. Feedback has stated that “the groups are where young people feel they belong and are not different to anyone else”. Carers fed back that during the activities there were able to spend quality time with their other children, be able to do spontaneous activities i.e go for lunch which they are unable to do at other times, spend time catching up on chores, and mostly “recharging their own batteries” to continue in their caring role. All projects went to plan providing the activities on schedule. By delivering the projects this has enabled us to grow and learn to be able to deliver the services needed and wanted by the young people and their families. The essential key to planning and budgeting is to gather and evaluate the feedback from young people, their carers and our staff. Through receiving the feedback from young people and their carers we were able to plan and budget for the delivery of the activities that were requested. Activities have been organised and run in accordance with young people and family. Parent /family consultation was successful with a high level of response from all, Feedback about current activities was very positive ranging from very good to excellent. Suggestions for future projects were also very good and will be followed up on. By working closely with our partners we are able to utilise their services and expertise, while SOAR can offer the same in return. An example of this is we work closely with St Duthus School, a local primary school for children with support needs. We help with some of the same children and work closely with the young person, families and school to ensure we are offering the young person consistency. The school permits us to use the facility for our Holiday Club. The school is ideal as it has a secure garden and entry system, big rooms and excellent changing facilities, in return we offer the use of our mini bus when the school requires it. Partnership working allows all parties the ability to work together in a consistent manner to achieve the goal of providing the best service possible for each individual. This has been a difficult task for SOAR Youth projects. Funding is become harder to source. The key is to have a robust funding strategy which can be utilised for funding applications. Having a funding strategy in place strengthens your applications but also allows project to not rely solely on grants. Match funding is also important as we have found funders support our projects more when we have had match funding in place. Research continuously to be able to gather information and find the most appropriate funders who are available to support your organisation needs throughout the year. 84 young people with support/multiple support needs will have participated and had more opportunities to take part in a wide variety of activities and have increased opportunities to interact and socialise with their peers. SOAR Youth Projects provided 50 sessions of School Holiday Club activities, 30 sessions of Swim Club and 34 sessions of Youth Club throughout the year. 82 young people with support needs attended these sessions. Our numbers were 2 lower than we anticipated, however we did have an increase in the number of young people who required 2;1 support to participate in the sessions. Activities included outings, sports, creative play, cooking, playing, crafts and much more. Through feedback provided by the young people we were able to arrange activities that suited their needs and wishes. Through this provision, the young people were able to participate in activities at their own rate, with no pressure enabling them to be successful in whatever interest they were pursing. The young people were also able to develop friendships with their peers who enjoyed the same activities. A 6 year old girl who has learning difficulties and suffers from seizures, never interacted with her peers . She also had great difficulty in being separated from her mother. Since attending SOAR , she is constantly asking when she will go on the SOAR bus and gets quite excited on days that she attends the clubs. Since attending SOAR , she plays with the other children and interacts very well with the SOAR staff. On her first few occasions at being at SOAR , she constantly asked for her mum, the more she has attended the less this is occurring. Her family feel her confidence is growing and vocabulary is improving slowly through attending SOAR. SOAR Youth Project were very successful in achieving this outcome as all families fed-back that they enjoy the respite time provided when activities are taking place. SOAR Youth Projects delivered 114 sessions of activities to young people during the past 12 months. Through the feedback provided by the young people their experiences were positive and fun. Through participation and enjoying themselves the young people had improved wellbeing through the participation, taking parts in sports, developing friendships and confidence. Carers of the young people fed back that they had during the organised activities, they had time to their selves, to relax, and catch up in the knowledge that their child was safe , having fun at the projects. Having the respite enabled carers to relax and improve their own well being, enabling them to carry on with their caring role. as one parent quoted " having my child at SOAR relieves stress". Anthony is a young boy who has Down Syndrome. He lives with his mum , dad and younger brother. Anthony' s mum finds it quite difficult to get Anthony to co-operate with the family morning routine of getting ready to go out or attend school. Anthony enjoys SOAR where he can spend time with his friends and feel s included, that on the days he attends the projects he co-operates fully and is always ready to go to SOAR on time. Through attending the projects, this enables Anthony's mum to spend quality time with Anthony's younger brother doing things that his brother enjoys but Anthony cannot cope with. Being able to have the time to do the above has improved the quality of the families well being, knowing that they have this time together while Anthony is happy attending the projects. SOAR Youth Projects provided activities to 82 young people with support/multiple needs during the last year. During these organised activities, 296 carers had opportunities to pursue their own interests. Monitoring and evaluation enabled us to learn and record the interests that the carers pursued. These included catching up with chores, spending time with grandchildren, meeting friends, doing spontaneous activities that they would not be able to do , including having lunch out with the rest of the family. We believe this was a very high success rate for this outcome 100% of families fed back that they undertook a pursuit during the time the young person was attending SOAR. A family whose daughter attends SOAR Youth Projects enjoy the respite time while she is at SOAR knowing the their daughter is safe and having fun. During the times that their daughter is a SOAR , the family take the time to participate in activities they are unable to do at other times. Mum said" I get time to spend with our other daughter who is only 7 as we feel she misses out on so many things due to the attention that her sister requires" During this respite time the family will go to the cinema, go to the beach, enjoy going for a walk and doing activities at home together. During the provision of 114 organised activities ranging from 3 hour breaks to 6 hour breaks. 296 carers had regular respite breaks. 23 more carers than we anticipated. The feedback stated that the majority of families felt relaxed just knowing their child was in happy in a safe and supportive environment. With the free time carers were able to pursue many different activities ranging from spending quality time together as a couple, spending quality time with siblings doing activities that are hard to do when their child is with then including going to the cinema, going out for a meal, to doing homework together with interruptions. Everyday chores from shopping, laundry to housework were also undertaken during these organised sessions when children were attending the projects. Through the delivery of the projects SOAR enabled all of the carers time to "recharge their batteries". Anna attends SOAR on a regular basis. Anna has support needs and can take a lot of attention from all of thefamily. Ann's family fed back that while at SOAR the time the family have has a huge impact on all of the family members. During this time, Anna's siblings have quality time with their parents that do not get when Anna is at home. Anna's mum feels that SOAR gives Anna her own thing outside of family life in return Mum and Dad have time together which enhances their quality of life. This time takes the pressure off the family. allowing them quality time together to do activities that they are not able to do when Anna is at home. They feel better supported to enable to carry on with their caring role. 84 young people will have participate in clubs, activities and outings in a wide range of local community venues including , local cafes, leisure centres, activity parks, playparks etc. 82 young people participated in clubs and activities throughout the last 12 months. 2 less than anticipated, however SOAR saw an increase in the numbers of young people who required 2:1 support. 82 Young people took part in in Holiday Club, Swim and Supper Club and Youth club. Activities included swimming, cooking, playing games, football, horse riding, going to local beaches, playparks, sensory days, themed days and many more. Young people were able to socialise, exercise, relax and spend time pursuing heir interests. Activities were led through the feedback received by the young people regarding the activities they wanted to do . The feedback was received informally and through the use of our wishing tree and from the sub-group meetings which are held at Youth club. To encourage community involvement , the activities were held in local community facilities including play parks in Tain, Alness and Invergordon and Invergordon and Alness Leisure centres to name a few. Nathan is a 12 year old boy who has additional support needs. Nathan is very shy and does not participate in any activities outside of SOAR Youth projects. During the last 12 months , Nathan has begun to attend all of the projects that SOAR offers. Nathan states that he likes coming to the projects and has developed some good friendships. Nathan feels part of the group and enjoys going along to use the local parks, leisure centres when he is with SOAR. Nathan's mum states that Nathan feels part of the group and enjoys taking part in all the activities within the community. Nathan's mum said" Nathan has grown in confidence and really enjoys being with others his own age at all of the clubs he attends". Through consultation, evaluation and the use of the wishing tree suggestions were made by the young people and their families regarding activities that could be provided by SOAR Youth projects. Nneeds and wishes include providing cooking days, exercise and sports, going out and about in the local community, games days , theme days etc, SOAR gathered the information and planned and budgeted to provide activities that met the wishes and needs of everyone involved. Through this we were able to provide 114 activity based days for the young people who attend SOAR. Holiday Club ran for 30 days providing 360 spaces for young peole to attend to participate in activities Youth Club ran for 34 sessions providing group activities the Sub -group had discussed agreed on and organised. Swim and Supper Club ran for 30 session providing 180 spaces for an activity that was designed to meet the wishes and needs of young people and their families. Andrew is 8 and has autism and learning difficulties. Andrew is a very likeable young person who can become quite focused on certain items and toys. While attending SOAR, Andrew added his suggestion to the wishing tree, that he would like a "Sonic the Hedgehog " day. 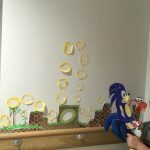 Staff accessed images and Andrew and the other children coloured in pictures, which were the stuck to a large wall which was designed to look like the video game. Andrew was so proud of himself, that this had idea had been put into place and all the children and staff enjoyed the session. Feedback from Andrew's parent was very good. Andrew's dad explained that Andrew was very proud of himself when he went home and had described the day in great detail to his family, showing them the items he had made,. 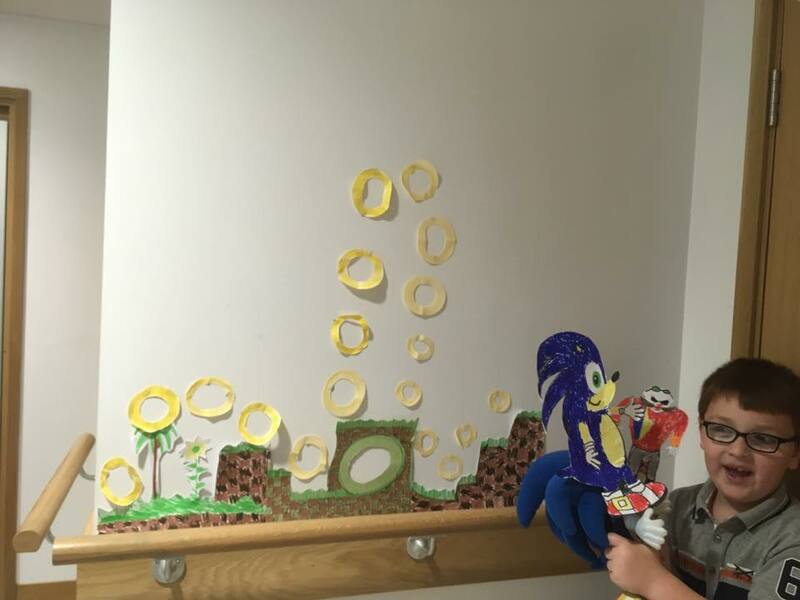 Andrew's family followed up on the activity at home where they made more pictures and spent quality time together with "Sonic the Hedgehog". "The experience was fabulous. I came back ready and able to take on whatever happens next"